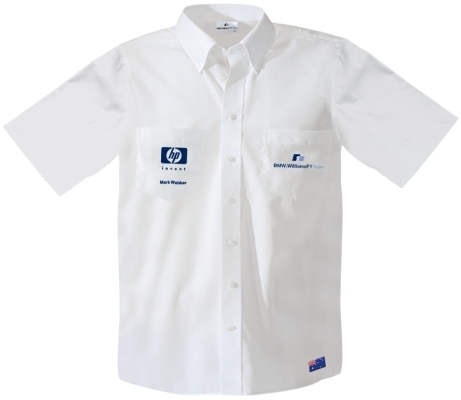 << Back Mark Webber Business Shirt - SPECIAL OFFER ! Mark Webber Business Shirt - SPECIAL OFFER ! Mark's official business shirt with the HP Invent logo on the right breast pocket + Mark Webber script, BMW Wiliams F1 Team logo on the left breast pocket and the Australian flag on the left bottom. Available in size M & L.
FREE packing, handling & shipping to ANY destination in the world ! This is of course official Mark Webber Merchandise. Mark Webber Ladies Top - SPECIAL OFFER ! Mark Webber Windbreaker - Ladies Cut - SPECIAL OFFER ! Mark Webber Windbreaker - Men's Cut - SPECIAL OFFER ! Mark Webber Longsleeve Shirt - SPECIAL OFFER ! Mark Webber Polo Shirt - SPECIAL OFFER ! Mark Webber T-Shirt - Logo - SPECIAL OFFER !